With their new lunch hours and prixe fixe menu, some friends and I went to Stone's Throw Bistro for lunch recently. We were not disappointed, not in the least! We arrived shortly before noon and at first were the only ones in the place, but as the noon hour approached, a few more tables were filled. 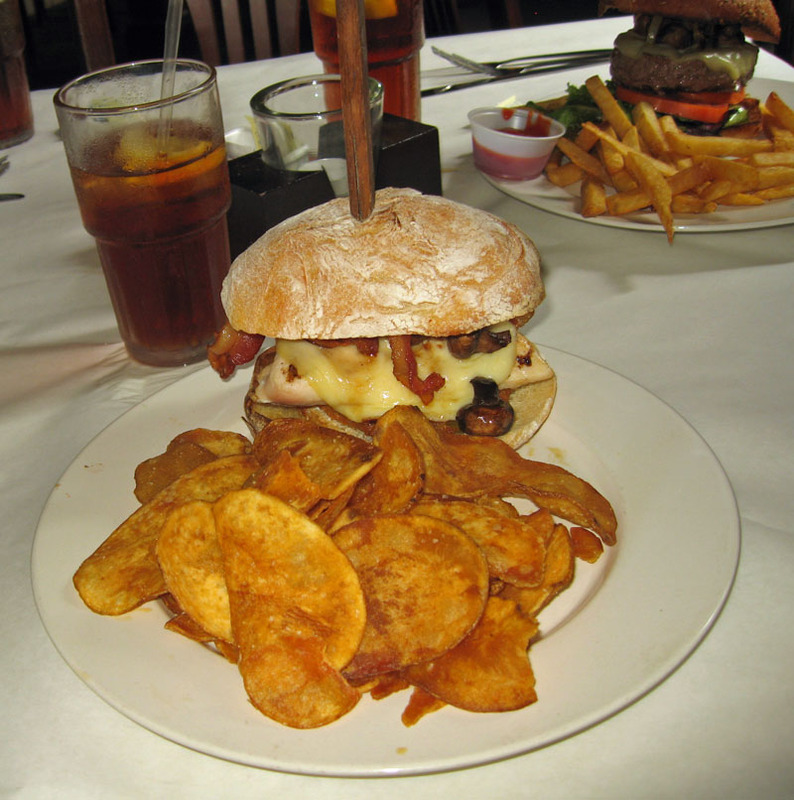 The have a new lunch menu at Stone's Throw a prixe fixe or "fixed price" menu. That is a limited select at a fixed price, but don't let that scare you, the combinations you can order will keep you coming back time after time, I know they will me! Bascially it's a soft drink, a "create your own" sandwich, and a choice of fries for $9.50. Given that two out of the three of us could only eat half of our sandwich or less, I'd say it was a good deal! The create your own sandwich means you get a piece of paper with various choices on it and you build your own sandwich--choose a bun, a meat, a cheese, various other go-withs, various sauces, etc. There is quite the combination. I chose several sauces on the side so I could try them all. My friend Dale ordered a burger but this was certainly no ordinary burger, as you can see from the picture. It was cooked perfectly to the medium-well that she requested. Her fries were hot and crisp and tasty. But the burger was the star here. The presentation was wonderful with a steak knife stuck right through it, but that was literally needed to hold it all together, it was a very big burger indeed. Dale confirmed that it was also very tasty, too. She enjoyed it immensely and could not even finish quite half of it, there was that much too it. She was impressed as were the rest of us. On a side note, one of Dale's sides was a fried green tomato. I also ordered one as a topping, but I pulled it out of my very tall sandwich and ate it as a side. It was very good. The breading was somewhat bready and doughy, but not in a bad sense, it tasted wonderful and the texture was not at all gritty. It was divine. I think I could eat a whole order of nothing but the fried green tomatoes, they were as good as any I've ever had, even better than my own! I had a chicken sandwich with provolone, bacon, and a bunch of other stuff. I also ordered some stuff on the side, including a several of their various sauces. First the sandwich. The chicken was very good, a huge piece of white meat, very tender and juicy. I'm sure it had been brined as it was just a bit salty for my taste, but with all the other stuff on the sandwich it was nearly perfect. The chips were also very good. Not sure if they make them there or not, but the were crisp and tasty. I used them to try some of the various sauces. My favorite was probably the Chipotle Aioli, it was very good. The Smoked Poblano Aioli was also quite good. I liked the Truffle Aioli but I think the delicate flavor of the truffle was overshadowed by the chips. I did however put some of it on my sandwich and it was a nice compliment there. We had a very good lunch here, my friends both agreed. We'd go back here again for the good food and the value. And I know I will be returning soon at night for a real dinner. Stone's Throw Bistro is one of my favorite restaurants, for sure. My friend and I decided to have lunch here on a recent Sunday afternoon. There was a wait, about 25 minutes, a testament to the popularity of Mimi's Cafe. It was worth the wait. I had eaten here several times in the past, but it had been a while. Now I'm wondering why so long? We did have a bit of a wait, but once seated our server was courteous and very attentive. We decided to start out with two of their "small plates"--more or less appetizer size portions meant to share or to be a go-with. The BBQ Pork Quesadilla contained tender pulled pork with a somewhat sweetish BBQ sauce, jack cheese, and red onions. It was accompanied by coleslaw and was very good. We also tried the Potachos--kettle chips topped with bacon, cheddar sauce, green onions, and diced tomatoes. This too was good. The cheddar sauce was not overpowering and was tasty. These need to be eaten rather quickly as after a time the chips can get a big soggy. However, it was very good and we cleaned up every last drop! For my main dish I chose the Patty Melt--a nice-sized patty of beef was grilled to a perfect medium as I requested. 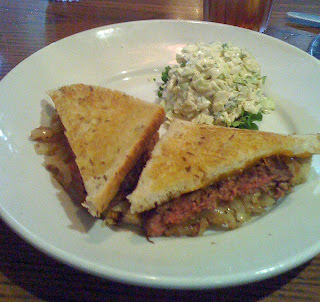 It was topped with cheddar chesse and grilled onions and served on grilled corn rye bread. 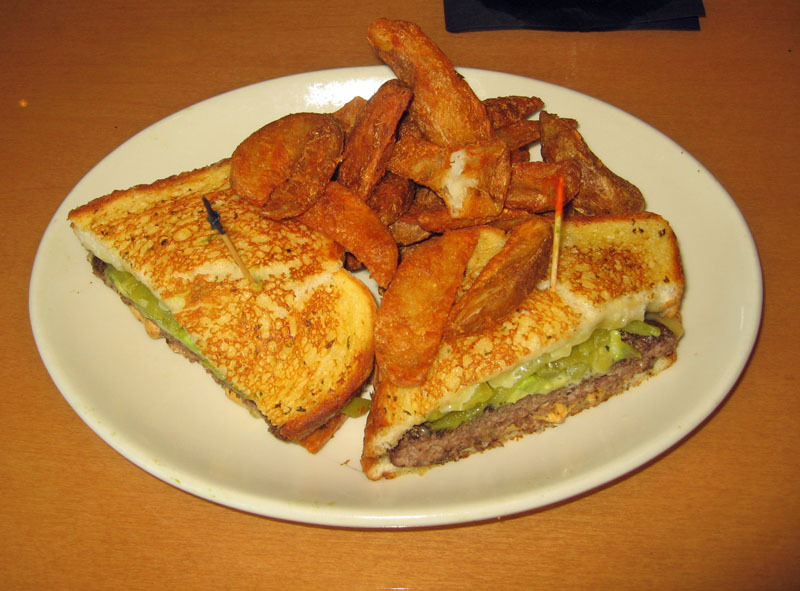 The tast of this sandwich was right-on, all I expect with a patty melt. However, I think there was one mis-step. To my mind, it was served upside down! It was stacked bread, grilled onions, patty, cheese, and bread. But what happened is that the juicy grilled onions made the bottom of the sandwich soggy. I'd suggest they server it on thicker bread or better yet, turn the dang thing over, upside down! But no matter, the taste was very good. It was served with coleslaw. I've never met a coleslaw I didn't like and this was no exception. My favorite thing about it was that it was not overly sweet. Yumm. 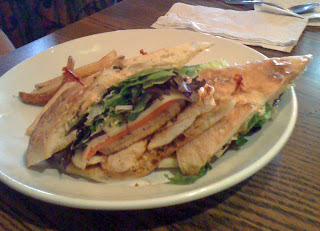 My friend Tommy had the Chicken Jack Ciabatta sandwich. Tender blackened chicken was piled on a ciabatta roll wiht grilled red peppers, onions, baby greens, and a citrus remoulade. This was a good sandwich but definitely a challenge to eat. It was pretty big and also a big mess. No, it was very messy. But oh, so good. 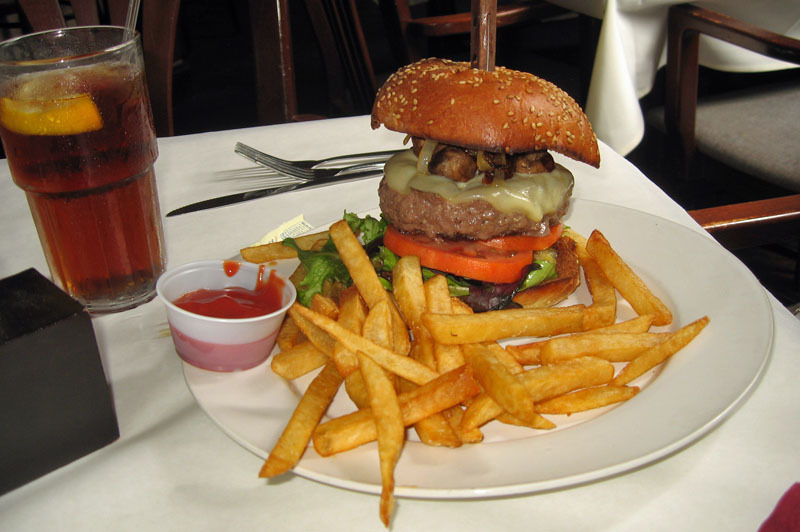 It was served with french fries. This was a good sized sandwich, and Tommy took about half of it home to enjoy another day. Overall we had a very nice experience at Mimi's. It's got nice atmosphere and our service was very attentive. I'd eat here again, definitely. What is Bigos, you may ask? 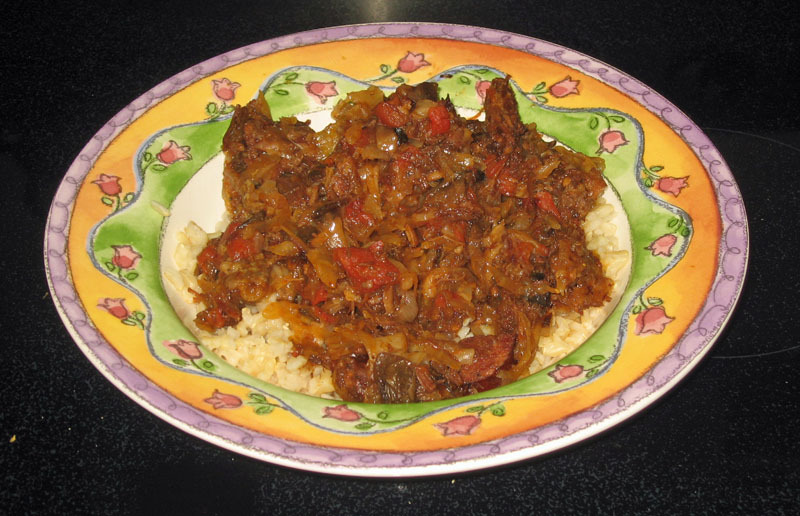 Well, it's a Polish dish, sometimes called "hunter stew" and often considered to be the national dish of Poland. It is not for vegetarians, meat rules in this dish along with other traditional Polish fare such as cabbage, sauerkraut, and mushrooms. I'd had Bigos a few times at some restaurants in the area and liked it. When I saw a recipe posted online on the About.com Eastern European Foog blog, I decided it was time to give it a try. I'm glad I did. So what did I do differently and what would I do different next time? I had some leftover kielbasa in the freezer, so I cut that into about 1/2 inch slices, then quartered those. For the other meat, I had some leftover frozen smoked pulled pork in the freezer and I used that. I'll tell you, the aroma of the hickory smoked pulled pork added a wonderful note to this dish. The tomatoes I used were a bit underripe and next time I'd use a healthy dose of tomato paste in addition to fresh tomatoes, I think that would have given it a nice note. Also, I'd use fresh mushrooms next time, and more of them. The reconsitituted dried mushrooms had a bit of a spongy texture, that's all. Overall, this turned out to be a very successful dish. I gave some to some unsuspecting friends. They thought it looked weird, but figured if I cooked it, it must be good. They absolutely raved about it, they loved it so much. And when my Polish friend Ewa tasted it, she thought I must have had her recipe--and she loved it as well. So, my word to you is, give it a try! Definitely Bardzo Smacznego--very good eats! I could not find the "gourmet" in the burger I had here at Red Robin Gourmet Burgers recently. Oh, it was an OK burger but pretty run of the mill as burgers go--I was expecting something different, something "over the top." And if you advertise something to be gourmet, wouldn't you expect it to deliver that? Well, Red Robin did not deliver the gourmet, they served me an average (good tasting but average) burger on my first visit to them. I won't say it's my last visit, as there were other things on the menu that looked good, but I would not go out of my way for a burger here. My friend Tommy and I stopped here recently for a late evening dinner. I'd heard of Red Robin and seen the ads and was drawn in. They were somewhat busy when we arrived, but we were greeted and seated promptly. The menu mentioned micobrews so that piqued my interest. But apparently they don't know the definiton of microbrews, because when the waitress recited their beer menu, there were no microbrew on it that I could tell, just plenty of big brewery brews, though some were their specialty brews, but no true microbrews from smaller independent breweries. I was a bit disappointed. But no matter, I had a Kilians Red. See what I mean, not a microbrew. 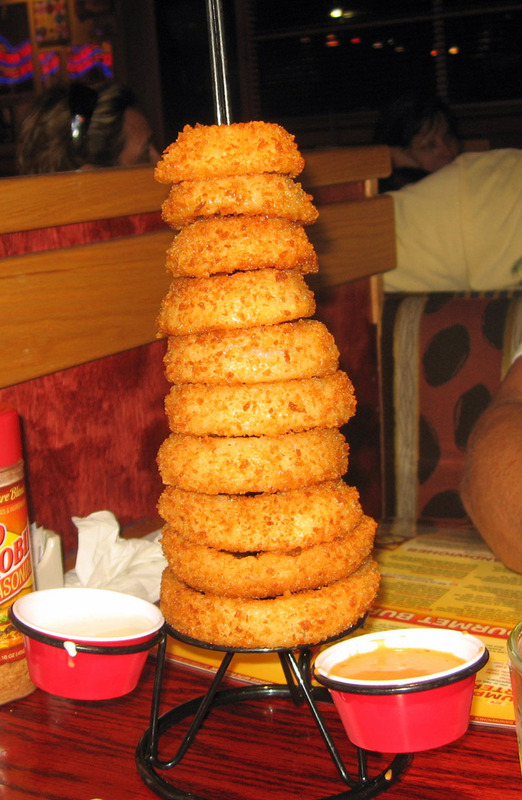 We started with an appetizer, the tower of onion rings. 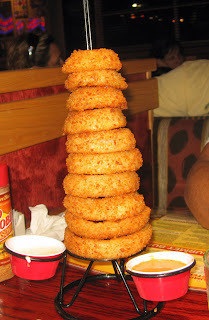 Thirteen onion rings were piled on a tower and served with two dipping sauces (don't try to count them in the picture, we ate some as soon as they arrived). The onion rings were good, fresh and hot with a nice crisp coating. They were good onion rings. One dipping sauce was pretty much an ordinary ranch dressing, not bad, just not special. The other had a barbecue base and had a bit of heat--I liked this one a bit more. The onions were nice and thick and well cooked and server very hot. Yumm! While waiting, we had a chance to look around a bit. The interior decor is very, very nice, warm and inviting, modern, with a friendly atmosphere. The colors were browns and reds and accented with some contrasts, all making for a very inviting atmosphere, a fun place to gather with a group, I'd think. In due time our orders arrived. I ordered the Red Robin Gourmet Cheeseburger. The say it's "the orignal upon which we have built our fame." I ordered it medium. The burger was garnished with crisp lettuce, fresh tomatoes, pickles, onions and mayo. For cheese I chose the old standby: cheddar. Now, it was a good burger. It was cooked just a bit beyond medium but that's a minor point. But, with all the other toppings, it was a bit difficult to taste the burger. I'd think if you called something a "gourmet burger" you'd want that to stand out. Well, though it was a good sandwich, I did not find anything gourmet about it--it was just an average good burger, no more, no less. And with all the "stuff" on it, hard to even taste the burger itself. The burger was served with ther "Bottomless Steak Fries." They were just larger cut fries, not at all spectacular, just average. I'd say they coudl have used another 20 seconds or so fo cooking time to make them a bit more crispy. They were good, but just average. 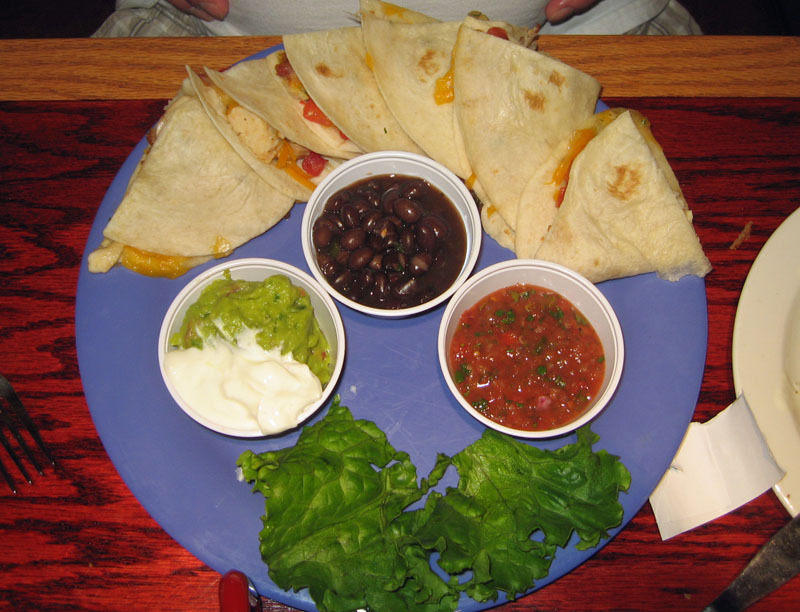 Tommy ordered the Just-In-Quesadilla from the appetzer menu. These were flour tortillas filled with sliced chicken breast, mushrooms, applewood smoked bacon, pepper-jack and cheddar cheeses, fresh cilantro, and tomatoes. It was served wtih small sides of chipotle black beans, salsa, and guacamole with sour cream. They were tasty. A pretty good quesadilla actually. Tommy liked the quesadillas, and I had a taste and agree, they were quite good. I also liked the chipotle black beans a lot, they had a very nice flavor. This was a good choice, a nice quesadilla. At one point during our meal a manger (at least I think it was) did check in on our. And our waitress was pretty attentive too. I'd say we received very good service overall. For fun you might want to compare my picture of the quesadillas to that on their menu...quite a difference, but then that's to be expected I guess. But overall, it was a good meal here, just not the gourmet burger I expected. You should deliver what you promise. For a great burger, you'll have to go elsewhere. 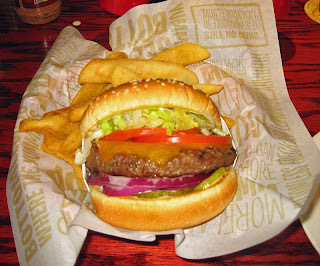 But for a good--but average--burger and decent food, give Red Robin a try. A few grinds of fresh ground black pepper, maybe 1/8 teaspoon. A pinch or two of salt, to taste. That's it. Toss everything together and taste as you go. Adjust the heat to your liking. Serve with tortilla chips and you have a great spicy tropical salsa! 2 2-liter bottles lemon-lime soda (I used diet!). Pour into glasses garnished with a piece of fresh pineapple and a blueberry or two. You will need to stir occasionally--the coconut creme contains fat and it tends to separate and also create a bit of a froth, but it also give the sangria a nice richness and velvety smoothness. We had a nice beachside meal here at Britt's Laguna Grill the other night. We were in Clearwater Beach for the afternoon/evening and getting quite hungry. After looking around a bit, we found our first choice to have a half hour to 45 minute wait. No! Too hungry for that. So we went back to this place--I'm glad we did. The have a fairly varied menu, and a nice beer selection. Drinking a cold one (it was a hot day out), I quickly spied the wood-fired pizza oven near the dining area and the pizza selection on the menu. Score! For my dinner I had the Buffalo Chicken Pizza: roasted diced chicken in buffalo sauce with sliced red onions and gorgonzola and mozzarella cheese. Yumm, this was very good. I asked for some buffalo sauce on the side which quickly appeared. The pizza also was served with some grated parmesan on the side, quite a nice touch and just a bit of it added a lot of flavor. 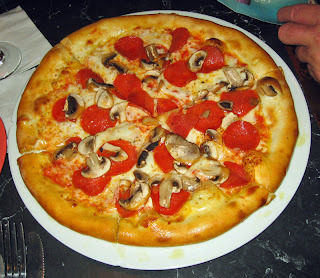 This was a very good pizza, the crust was very tasty and tender and it was cooked well, nice and crispy on the bottom. I liked it a lot and only managed to eat 2/3 of it--but took the remainder home to devour at a later time (I did so on the beach the next day). I'd rate this as one of the better pizzas I've had for a specialty pizza. I loved it! My friend Tommy ordered a pizza too--they just sounded so good and the thought of oven fired pizza seemed so right with a cold drink on a hot day. He ordered a Pepperoni and Mushroom Pizza. He did ask for it to be well done, even a bit brown on top, and it was not, a bit of a mis-step. Still it was cooked well and done. This too had a lot fo flavor from a nice but not overpowering tomato sauce to a good but not overpowering proportion of ingredients. A very successful dish. He too had some leftover for tomorrow's lunch at the beach. Overall we had a very good experience here. The beer and wine were cold, the pizza hot, the Air Conditioning inside worked perfectly (it was hot as blazes outside) and the service provided by Cheryl was very attentive. I was surprised to find a place this good and this reasonable right off the beach. Definitely a cut above some of the usual beach food. I'd come here again. Give it a try, definintely good eats and a bargain on the beach. My meal here the other night on a Monday night was good, but not great. I was more impressed on my previous visit. But still the food was good. I'd been travelling all day, 9-10 hours on a plane or in an airport, and had been home a bit and was now tired, so my friend Tommy and I decided to head back to Terra Mia in Lake Mary. For my entree, I had the Tortellacci: a cross between a tortelline and a ravioli was served in a tomato sauce. It was pretty good, though a bit heavy. But the flavors of the tomato were fresh and bright, and the pasta nice and flavorful. My friend Tommy had the Pollo Parmagiana, parmesan-crusted chicken served with a tomato sauce over spaghetti. Tommy mentioned that it was very salty. I tasted it and I'd agree, way too much salt. It would have been a pretty fair dish if it wasn't for the heavy dose of salt. I have to wonder if the chef ever tasted the sauce for this dish. Overall, our experience here was just OK. for the fancy menu, fancy web site, and fancy surroundings, I was not overly impressed. I think next time I come it will be for the pizza, judging from those around us, that's what's popular and good here! 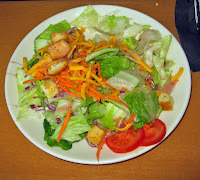 The LongHorn Steakhouse in Lake Mary is very convenient for me, both from home and for work. I have eaten here a number of times and always have enjoyed the food. My recent visit on a Tuesday night was no exception. We started out with an appetizer, the Firecracker Chicken Wraps. Tortillas were stuffed with spicy grilled chicken and cheese, rolled and fried, and served with a cool avocado-lime dippoing sauce. These were very, very good. 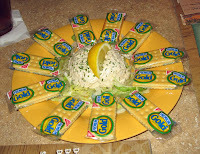 The presentation was wonderful and they were very fresh, still hot, and very flavorful. I could have eaten a plate or two of these and been perfectly satisfied for the night. For my entree, I had the Redrock Grilled Shrimp, skewers of a dozen grilled shrimp glazed with a smoky tomato butter, served over a bed of rice with a garlic butter sauce. The shrimp were cooked well, not overcooked. They were tender and delicious. 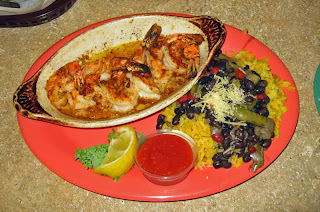 The rice was very good as well, and served to soak up a bit of the "juice" from the shrimp. It was a very good meal. My friend Tommy had the 12 oz. Ribeye Steak. It came to the table perfectly cooked, tender and juicy. Quite a good steak! It was served with a loaded backed potato--and yes, it was sure loaded. He enjoyed his steak a lot. Overall, we once again had a very good meal at the Lake Mary LongHorn Steakhouse--i've never been disappointed with my meal here and will be back again, no doubt. Definitely good eats! I stopped here on a recent Sunday afternoon with my friend for lunch and did not leave disappointed. Rather, I left satisified and full, a good thing. First of all, it's a chain. But, if my first experience here is any indication, it's going to be a successful chain. BJ's Restaurant apparently started out in California, then later added a brewhouse, and now they serve a lot of their own brews. I tried two and they were both good. The first one I tried was the Jeremiah's Red, an Irish-style red ale. It was pretty good though maybe just a tad too sweet for my taste, but definitely a good beer. The second I tried was the Piranha Pale Ale--I liked this on very, very much. I am a fan of pale ales and especially IPAs, and this was right on the mark for my taste. But of course, I was here for lunch, so on to the food. My friend Tommy and I started with an appetizer, the California Club flatbread pizza. This was a hit! It was a nice and thin flatbread, cooked perfectly, topped with grilled chicken, applewood-smoked bacon, tomatoes and mozzarella, drizzled with roasted garlic aioli and toppe with some fresh diced avocado. Yumm, we both agreed that it was a real hit. 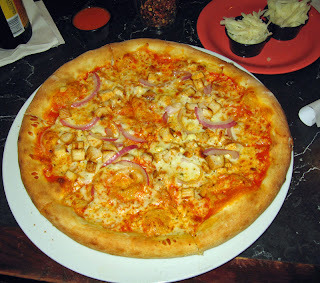 The toppings were flavorful and distinct, yet did not overpower the nice and crisp crust. I could eat one or two of these myself. The portion was not huge which made it a perfect appetizer for two, eight slices of yummy goodness. I ordered a salad to go with my meal, but I made a mistake, I should have asked for the dressing on the side. Oh well. 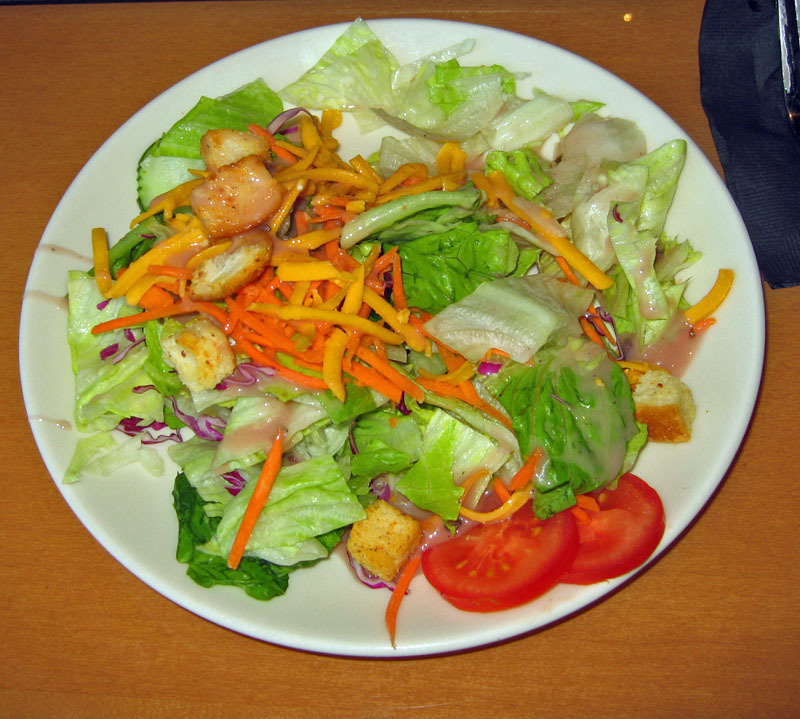 The salad arrive and was nice and fresh iceber lettuce with some carrots, cheese, tomato, and cucumbers. The dressing was a raspberry-walnut viniagrette. I'm pretty much a minimalist when it comes to dressing, so there was too much for me, but your mileage may very. The salad was very tasty. One thing that really impressed me was the croutons--they were exceedingly crisp, the practically exploded in my mouth when I bit into one, and that was a good thing. I liked my salad, can you tell?? For my appetizer, I ordered the Fish Tacos. I love a good fish taco, but sometimes they are just messy and flavorless. 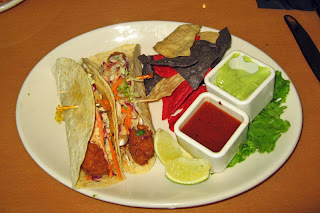 These were exceptional, perhaps the best fish tacos I've ever had! A long strip of halibut had been breaded with panko bread crumbs, then lightly fried, placed on a tortilla and topped with chipotle mayonnaise, Santa Fe dressing, napa cabbage, carrots, red onion, and cilatro. It was served with some tortilla chips, and avocado cream sauce, and a fire-roasted tomato salsa. When served, they were very fresh. The fish was still hot and very tender and cooked perfectly, the veggies cold and crisp. I loved the flavor of this dish. The chips and cream/salsa were a nice touch, though I found the fire-roasted tomato salso to be too thin, it didn't really want to stick to the chips. I did pour just a bit on my fish taco and that jazzed them up even further. I loved this dish, it was excellent, as good as any I've ever had! My friend Tommy ordered the California Burger. It was a half-pound angus buger topped with avocado, roasted green chilies, pepper jack cheese and chipotle mayonnaise dressing. It was served with potato wedges. 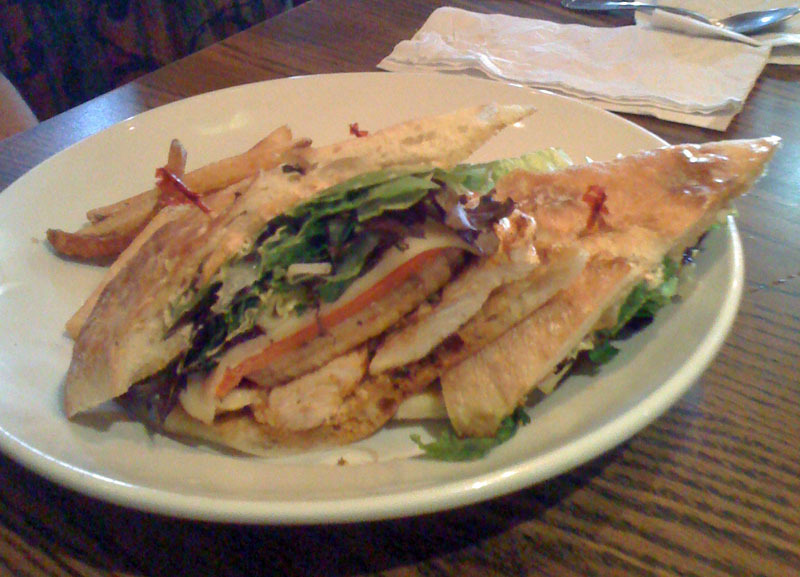 The sandwich itslef was very good, served on toasted thick bread. The burger was cooked medium-well, but was still plenty tender and juicy, a testament to good technique. I had a taste, and this sandwich was awesome--and huge. He took home half of it to save for another time. The only real misstep we experienced was that someone who was not-our-waitress brought out the food. Right after that, Tommy wanted some ketchup for his potato wedges, but we had to wait a bit to flag our waitress down. Not a big deal. Overall, I had no complaints at all about the food here. I'd go back in a heartbeat and take friends and/or family here to eat. The prices were reasonable, the beer variety good, and the food tasty. We arrive about 2 PM on a Sunday to find them still quite busy from the lunch rush. They are a pretty new place, but my gut instinct tells me that if they continue to pay attention to the details and give good fresh and well cooked food promptly at a good price, they'll develop quite a following and be around for a long time. 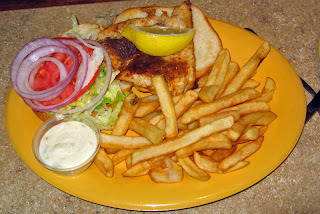 We both agreed that we'd like to come back and sample some of the other menu items, everything looked very good. Definitely good eats! My recent dinner at Thai Erawan left me disappointed with just one thing. Unfortunately, it was the food. I had seen some good reviews for this place on urbanspoon.com and was in the area on a recent Saturday evening so decided to give them a try. The interior is lovely, very soothing, spacious and elegant. We were greeted promplty and seated and our waitress was very attentive the whole evening. The service, decor, and even presentation of the food was all marvelous, but the food itself fell short of what I expected. We started with two appetizers. The first was the Steamed Dumplings. The filling itself was somewhat indiscernable, looking sort of like sausage, though it was indeed tasty. According to the menu it was composed of shrimp, ground pork, crabmeat, water chestnuts, bamboo shoots, and mushrooms. It was served with a soy sauce that was mild and pleasant and not overly salty. This was the best dish of the evening. 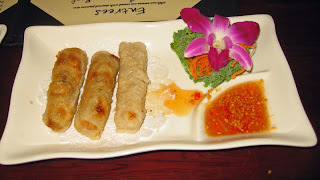 The second appetizer was the Erawan Crispy Rolls, shimp, crabmeat, ground port, and vegetables wrapped with rice paper and fried. They were served with a house sweet & sour sauce. The menu claims that they were sprinkled with ground peanuts, but in reality there was not a single piece of peanut to be seen or tasted. The filling was somewhat bland and not very special. It, too, looked more like sausage, a mish-mash of stuff. It was tasty, just not too special. They were deep fried and they seeme just a bit overly greasy as if the oil had not been hot enough or something. They were mediocre at best. I ordered the Tom Yum Shrimp soup, billed as "the famous spicy and sour clear soup with shrimp seasoned with galanga, lemon grass, lime juice, mushrooms, and scallions. I was disappointed on three accounts. First, the citrus was over-powering, and it was not the citrus of lemon grass. I felt like lemon juice had been haphazardly added to the dish--it overpowered what should have been delicate tastes and fragrances. Second, it was not very spicy at all, quite mild. 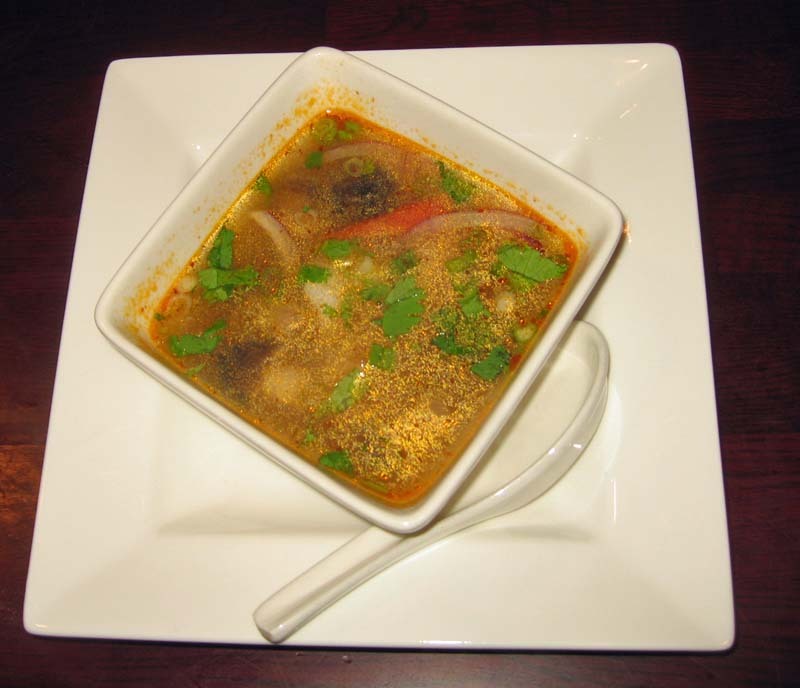 The Tom Yum soup I've had everywhere else is always somewhat spicy, this was not at all. And finally, the shrimp--there were three of them and they were all way overcooked to the point of being somewhat rubbery. Fortunately the portion was rather small for the price. 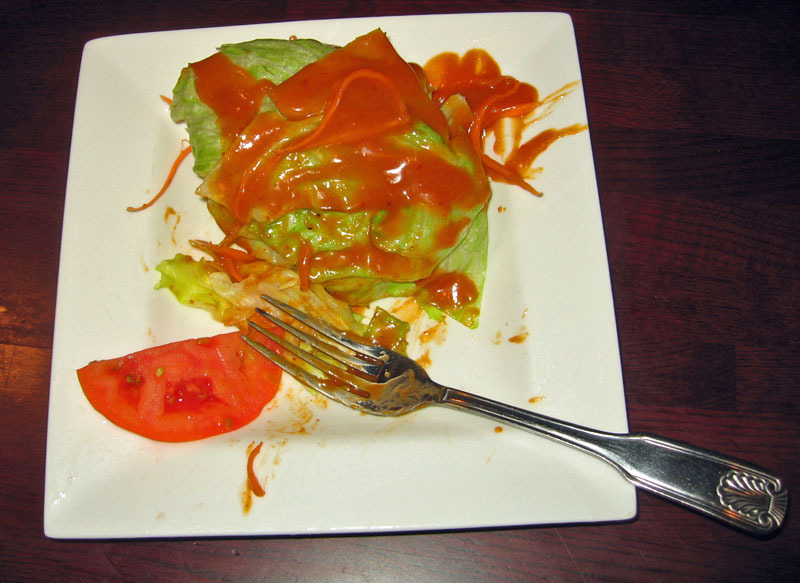 I ordered a side salad, it was bit of iceberg lettuce and some carrot and tomato, doused with a very sweet and peanutty dressing. It was more sweet than I like in a dressing, but still flavorful. However, I thought there was too much of it. But all in all, it was not a bad salad and I cleaned it up, leaving some of the excess dressing behind. For my main course I ordered the Volcano Shrimp. The menu says that this contains, broiled jumbo shrimp topped wiht chili sauce and steamed mixed vegetables. I ordered it with medium heat and that's what I got--I liked the heat. The shrimp themselves however were somewhat mangled and way overcook, way, way overcooked. I could barely cut them with my knife, and they were even a bit stringy. The shrimp looked like they'd maybe been butterflied but whatever, they had been cooked into oblivion and sent to restaurant hell. 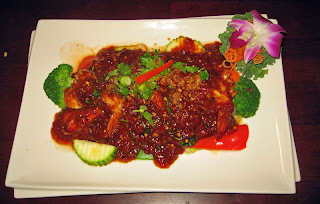 The vegetables under the chili sauce were good and flavorful, though not so plentiful, but there was a lot of chili sauce. I was not impressed with this dish at all, outside of the beautiful plating. For his main dish, my friend Tommy had the Chicken Hot Pepper. 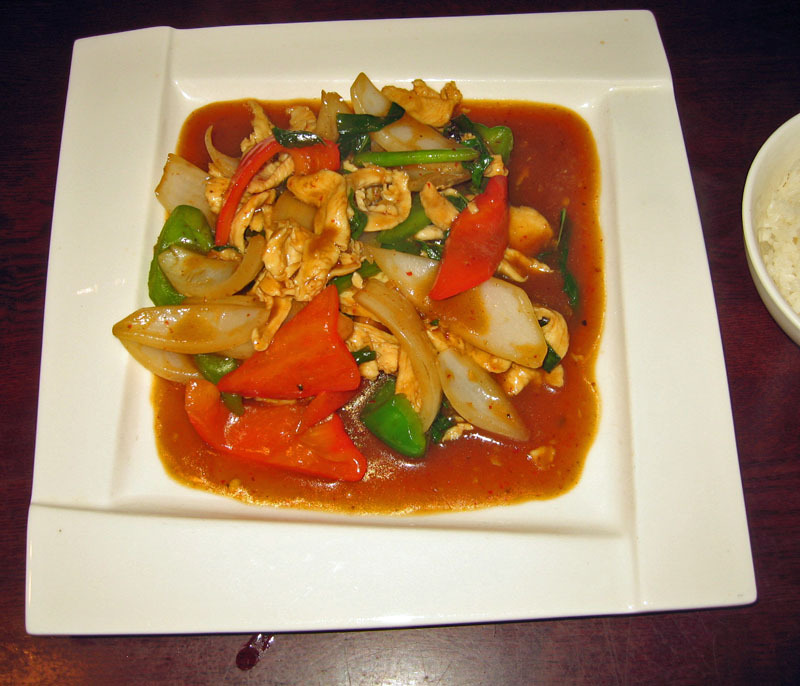 Strips of chicken were said to be sauteed with chili paste, bell pepper, onion, and basil leaves. The dish looked appealing and the sauce was very good, I tried a bit of it. Same with the vegetables. But Tommy's complaint was about the chicken itself--it was very bland. It seemed like boiled chicken had been thrown in as an afterthought--it had none of the flavor of the sauce or vegetables. It was not a bad dish because everthing except the chicken had a lot of flavor. But when the title of the dish is "Chicken Hot Pepper" you'd expect the chicke to be the star and have more flavor--it wasn't and it didn't. Overall, I was diappointed in Thai Erawan's food. Again, atmosphere, hospitality, service, ambience and plating were all very good. Only the food did not match up to the expectation. Not bad food, but there is better food to be had in the area, so I can't really call this "good eats," just "barely OK eats."